Als je op zoek bent naar een karakteristiek restaurant waar je sfeervol kunt eten, dan zit je hier goed. 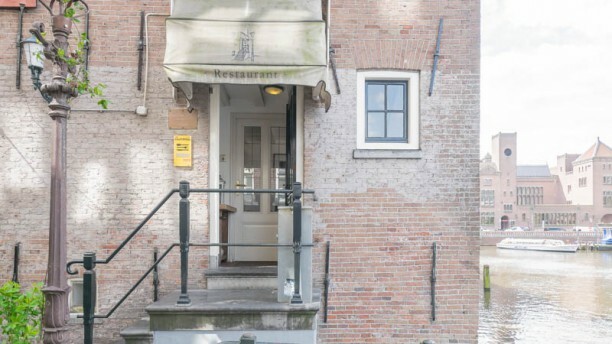 Dit restaurant zit al sinds 1992 midden op de Wallen op een idyllische plekje aan het water. En wat is het binnen een enorm contrast met de drukte buiten. Binnen tref je een super knusse zaak aan met een klassieke uitstraling en uitzicht over de gracht. De tafels zijn verdeeld over drie etages waardoor je lekker in alle rust kunt genieten van je lunch of diner. Chef en eigenaar Bert van Buschbach kookt puur en eerlijk en in de klassieke gerechten met een moderne twist komt zijn liefde voor de Franse keuken terug. Ook is hij gek op truffel. Je vindt deze delicatesse dan ook regelmatig terug in de gerechten. Heeft je gerecht in de basis geen truffel of wil je extra truffel? Geen enkel probleem, dan bestel je toch gewoon extra. Op zoek naar een bijpassende wijn? Sara helpt je graag er eentje uit te kiezen uit hun imposante wijncollectie. Tip van bySam: Vraag naar de aardappelschuim met krokante aardappel, truffel en een thee van paddenstoelen. Dit gerecht staat al jaren op de kaart en is de favoriet van velen! At De Compagnon in Amsterdam you will immediately notice the great wine wall in the middle of the place. The wines are a welcome addition to a great meal and will perfect an already nice dinner. The chef brings surprising combinations of ingredients on your plate and will make you walk out with a smile, no doubt! Thank you so much! We hope to see you again. Thank you so much! See you soon! Lucky to eat here at fork event. 50% discount. We chose 4 course aka carte menu because we can choose all dishes. Some dishes was great. Potato foam soup, scallops and the fresh goose liver. The prime rib steak was huge. My own steak is better tbh and I think we source from same place. I should have chosen separate fish and sirloin steak. Very disappointing was the ravioli. The pasta was too undercooked to be called al dente. Just two pieces also. Atmosphere was great. Casual fine dining. Not stuffy and caters well to locals and tourists. Worth it even when paying full price. The steak was quite good value. Btw portions was huge and you are safe when ordering 3/4 course. Don’t worry if u try 7 courses because portion will be adjusted. Thank you for visiting our restaurant! I'm sorry that the ravioli was disappointing to you, but I'm glad that you enjoyed the rest of the menu. Thank you for your feedback. We hope to welcome you again! The worst service I've ever had in Amsterdam. We arrived yesterday and spontaneously the waiter gave us the worst feeling we have come and told us to order quickly because it closes what was not right were people who stayed behind us. Then I asked for a sudden job of baskets of seafood and pork, the waiter did not bring us fish! And brought us dry and hard chicken we did not touch the dish !!!! He did not even change it for us and then we went to eat steak somewhere else. Never come near this place ever !!!!!!!!! The worst service there is, the worst waiter I've ever had. I left feeling sad and disappointed and hungry! We are very sorry that you had this experience in our restaurant. We do not want our costumers to feel not welcome. I believe that in this situation there was miscommunication, and we are sorry for that. We hope to welcome you in the future and that we will see you again. Heel erg bedankt! Graag tot de volgende keer weer. We had a wonderful evening with very good food. The food was absolutely wonderful, and the wine was a perfect match with each course! My boyfriend and I were seated at a small table tucked away in the corner, this location, paired with the unbeatable service, made it feel like a private dining experience. I would definitely recommend starting your dinner with one of their many special gin and tonics on offer. It was quite a generous portion and tasted wonderful. We've had lunch here previously. This time we opted to come for the 5 course truffel dinner. Great food in an unpretentious atmosphere. Every course was a delight, well prepared and beautifully presented on beautiful timeless looking Scandinavian plates. The service too, was outstanding. The location is lovely on a small alley and if you get to sit at a window side table, you get a view of the canal. Truly a hidden gem.